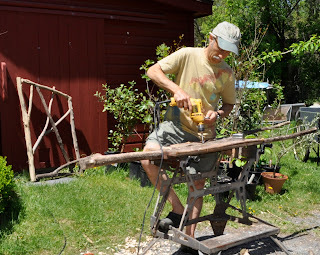 The only rot resistant part of cedar is the heartwood, and 3 or 4 inch diameter posts such as I used have a red tube of heartwood running up their centers only an inch or so wide. The rest rots, which it did very thoroughly over the past 15 years. 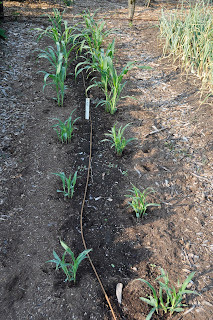 This year’s plantings, like those of past years (pictured at right), is Golden Bantam sweet corn in one vegetable garden and Pink Pearl and Dutch Butter popcorn in the other. 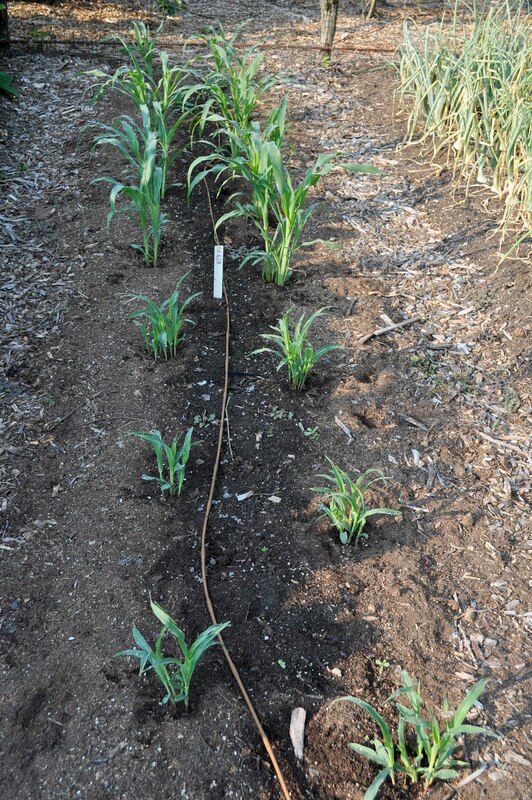 I isolate these plantings to prevent cross-pollination from making the sweet corn less sweet or the popcorn less poppable. It’s amazing how exciting a little bit of greenery can be. And I do mean just a little, eensy-weensy bit. That exciting greenery is in the barely expanding buds of grafts I’ve made over the past couple of weeks. I also grafted a Chief gooseberry onto a single-stemmed clove currant, again at a height of a couple of feet, to create a gooseberry plant that, rather than its usual sprawling self, becomes a miniature tree. 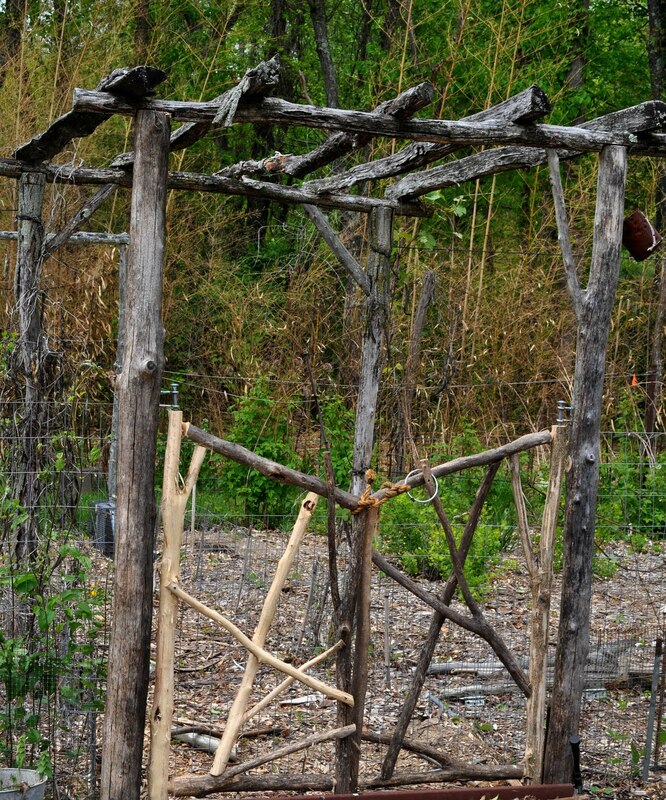 Getting branches up off the ground may put the leaves beyond reach of the voracious imported currant worm and also makes a neat-looking plant. A couple of stems of the Black Plum variety of cornelian cherry that I grafted up in a tree of Redstar cornelian cherry should, if the graft takes, provide cross-pollination and more variety from a single tree. Cornelian cherry is difficult to graft. I’ve failed every year for the past 6 years. I also grafted a lot of apple and pear stems onto dwarfing rootstocks. 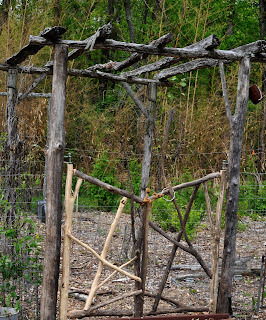 I already have plenty of apple and pear trees so I’m not sure exactly why I made more. Grafting mania? 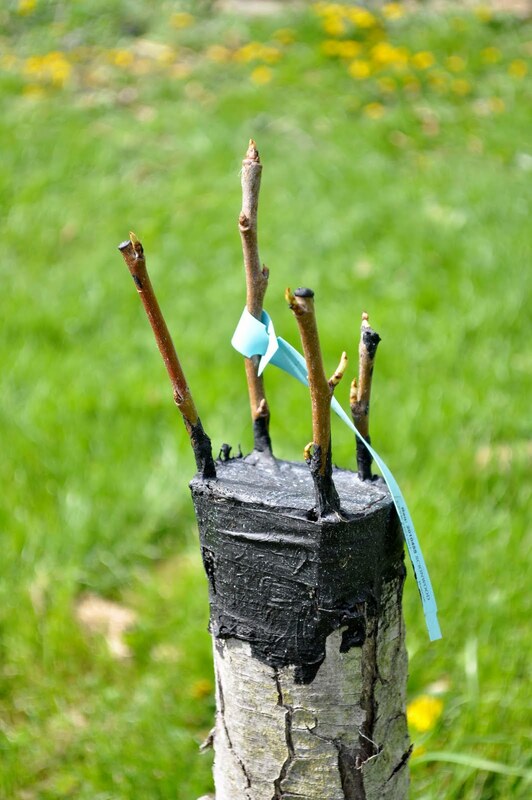 I’ve grafted apples and pears for many years and typically have almost 100 percent success. They still elicit excitement as they begin to grow. Not to brag, but I it’s May 3rd and I just had my first strawberries of the season. Obviously, these are not your run-of-the-mill garden strawberries, which typically begin ripening around here in June. The strawberries I’ve just eaten are alpine strawberries, not-your-run-of-the-mill red alpine strawberries, but white alpine strawberries. 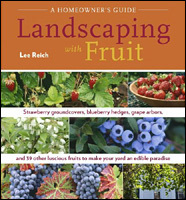 I’ve grown these plants for many years (and devoted a chapter to them in my book Uncommon Fruits for Every Garden). Mostly, I grow them in pots. 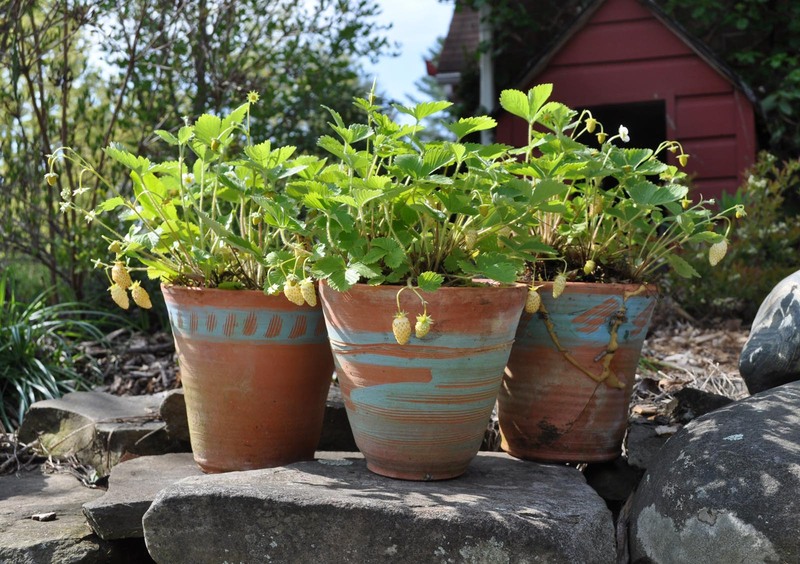 In contrast to garden strawberries, alpine strawberries don’t make runners, so don’t sprawl out of the pots or all over the place planted in the ground. Alpine strawberries also are everbearing, pumping out thumbnail-sized berries all summer long. If they are in a pot in a greenhouse or at a sunny windowsill, they’ll fruit from early spring well into autumn, whenever temperatures and light permit. 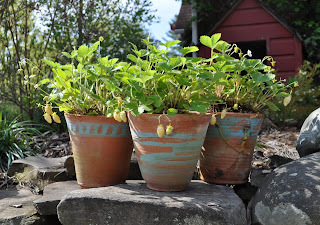 My potted alpine strawberries go into the greenhouse in March and spend summer decoratively poised on the ledge along the path to my front door, where ripe berries can be plucked in transit. I prefer the white to the red alpine strawberries. That’s because all alpine strawberries taste like cotton soaked in lemon juice until they are dead ripe. Birds peck the red varieties at their first blush of red. Birds don’t notice ripe berries of the white varieties, which indicate their ripeness with darkened seeds and an ambrosial, pineapple-y fragrance. I didn’t realize a money plant could be so pretty. 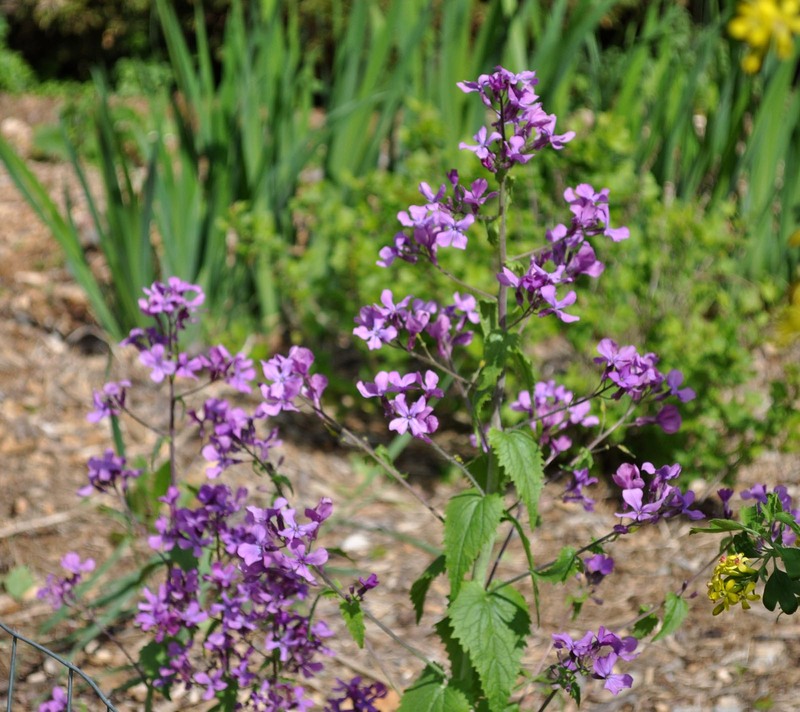 The plant is sometimes called “silver dollar“ plant, sometimes “honesty,” and sometimes “lunaria,” its botanical genus. The seed capsules – silvery, round, and flat – are how it’s most recognizable. Never having grown the plant, I wasn’t prepared for the beauty of the flowers. Each blossom has four purple petals in the shape of cross, the shape indicating kinship with dame’s rocket and other members of the cabbage family, Cruciferae. (Cruciferae means “cross-bearing;” the newer family name is Brassicaceae, from the Celtic word bresic, meaning "cabbage"). 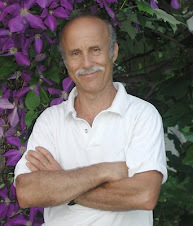 The “money” part of money plant more definitively identifies it as a Cruciferae. That’s what remains of the fruit (botanically, a silique) after it matures, and its two covers split off to leave a thin, round, silvery septum with imbedded seeds. The whole family bears siliques, but not leave that round, silvery membrane. Radishes, for example, bear long, thin siliques, which have a nice, spicy flavor and crisp texture when green and fresh. It’s worth letting a few radish plants go to seed. I planted money plant late last summer. 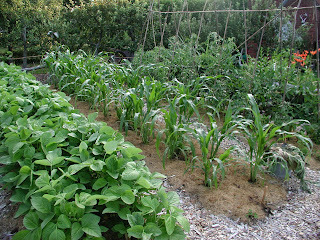 It’s a self-seeding biennial or short-lived perennial so silver dollars should be a permanent fixture here from now on.